You put thought and love into your personal treasures and should ask no less of us. Occasions is up to the challenge! For security of your jewelry, we photograph every item that you place in our care. We also fingerprint any large diamond using our Gemprint technology. Each of our jewelers has a microscope at their workstation. This allows them to see and fix microscopic issues before they turn into big problems. Our computer guided engraving technology allows for smaller and more precise engravings. Only using new clean gold keeps any foreign contaminates from making your jewelry brittle. Our in-house craftsmen are true masters, continually studying and updating their methods with the latest techniques. Our secret weapon? 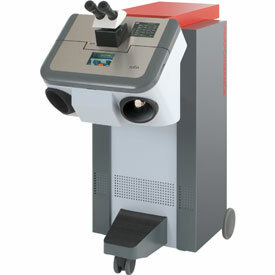 It’s our Rofin Star Weld 6002 Laser. It delivers a weld 70% stronger than traditional jewelry welds. It also allows for smaller, more intricate work. It’s awesome. Our special polishing compounds and 4 step rhodium process makes white gold shine like crystal. After repair, your jewelry goes through 3 quality control levels to insure that we took care of you correctly the first time.